Not all injectable sessions are created equal. To get the optimal, natural-looking benefits you deserve, choosing a highly trained and experienced provider is key. This is where Skin Care Institute shines. We’re proud to share that we were recently acknowledged as one of the top 250 injectable providers in the nation by Allergan®, the makers of Botox®, Juvéderm® and other leading injectables. The injectors at Skin Care Institute are the best of the best, drawing from years of experience and a thorough anatomical knowledge to achieve superb results while minimizing side effects. Injectables take only minutes to administer, but they are not intended to be performed on the day of a big event. While many patients experience minimal to no downtime, there are still side effects you may not want to show off, such as swelling, bruising or pinpoint bleeding. Play it safe by allowing a full week of buffer time for any side effects to dissipate. Botox can take more than a week to reveal optimal benefits. Dermal fillers may offer instant plumping effects, but they take time to settle into the natural contours of your face. 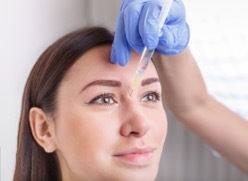 Since dermal fillers may cause swelling, it can be difficult to accurately assess your results until swelling subsides. This common side effect is almost unavoidable. Any time you inject your skin, you will experience some amount of swelling. The best way to curb swelling is by applying a cool compress to treatment areas and relaxing in the privacy of your home. We frequently reassure patients that swelling typically subsides within a week to reveal natural-looking, rejuvenating benefits you’ll love. Wanting more than you might need. There are two cardinal rules with injectables: 1) a little goes a long way and 2) you can easily add more, but it’s harder to take away. We sometimes see patients return after their treatment feeling dissatisfied with Botox because they still see lines. In general, we like to be conservative with Botox so that you still have movement in your eyebrows. Injecting too much Botox can make your brows heavy, which has the opposite effect of rejuvenation. Our expert injectors will always work closely with you to ensure your end results match your goals. Injectable treatments take great skill, precision and finesse to administer, but treatment is still an art and not always predictable. Slow and steady always wins the race. You can boost your long-term satisfaction by giving yourself ample time to adjust to your treatment and allowing your injectables to fully take effect and settle in. We encourage you to follow up with questions or visits for any persistent concerns or unmet needs. We are always here to help! To devise your optimal injectable treatment plan, call 918.948.9639 or click here to schedule your consultation today.